A sea gull stands on a large rock on the sand bar in Bar Harbor, April 29, 2016. Bar Harbor voters approved taking over a defunct ferry terminal and turning it into a cruise ship terminal. In Bar Harbor, voters approved a proposal from the town to acquire a defunct ferry terminal for development into a new cruise ship terminal. Residents Tuesday voted 945 to 658 in favor of a proposal to rezone the former Canadian ferry terminal off Eden Street, which will allow for the terminal to be rebuilt and serve as a dock for cruise ships and other maritime vessels. 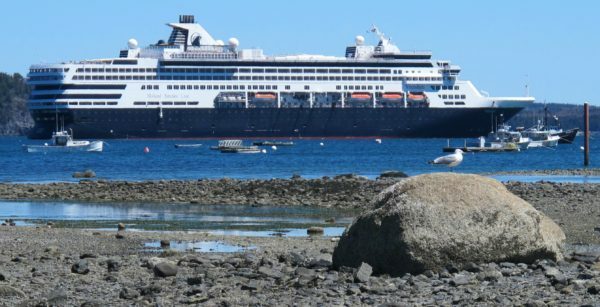 Voters rejected another proposal from a citizen’s group that would have prohibited the town’s rezoning of the parcel, prevented vessels longer than 300 feet from docking at the ferry terminal and would have allowed residents the discretion to change the daily limit of cruise ship visitors. That measure failed by a 679 to 925 tally. Bar Harbor sees about 3.3 million visitors every season and an average of about 140,000 of those visitors arrive on a cruise ship or other commercial tourist maritime vessel. Currently, in the town’s peak cruise ship seasons, between May 1 and June 30, and Sept. 1 and Oct. 31, no more than 5,500 passengers per day are allowed to disembark at the terminal. That number drops to 3,500 in July and August.